Acorn is an image editor for Mac OS X 10.10 and later. "Easy to use and understand"
I like that it's a "scalable" software, meaning that for someone like me who doesn't use it for high-level projects, I still feel like I can operate it. Sometimes the "bigger" programs out there feel out of my league, but Acorn lets me get the simple stuff done with zero problems and a lot less confusion. Because it is a little more basic, there are some instances when I want the software to be able to do something, and I feel like I can't figure out how to do it - at least not easily. It is inexpensive but can handle a lot of grunt work, especially for small businesses. That's primarily where we use it. We post a lot of content online, so we're always making images for that content. This often means overlaying text on an image, resizing images, or even designing images from the ground up by combining icons and other items into one cohesive set. Acorn is quick and easy to use for this purpose, meaning I don't spend extra racking my brain to figure out how to get everything in one place. Speed and ease of use are of the essence for what I do. "A Basic Image Editor that can be a Great Tool for Hobbyists "
I originally purchased acorn as part of an app bundle way back in 2009. I have used it multiple times and it seems to fit the need of a comprehensive photo editing app, without the huge price tag. In fact, Acorn is even more affordable than the majority of the other lower cost photo editors. The interface of acorn provides powerful, customizable tools, however today the interface feels a little dated and uninspired to me. It functions perfectly well, but doesn't have the same modernization or ease of use of other similar applications. If you are looking for an app to handle a variety of photo editing functions beyond the basic photo filter appliers, but don't want to spend a bunch of money on other more popular photo editors because you are primarily a hobbyist, Acorn is the app for you. Acorn is powerful, but doesn't quite have all of the features of the more popular (though more expensive) photo editors. For a hobbyist looking for an affordable solution it is perfect, but for businesses with more advanced photo editing needs it might not yet be the ideal solution. What Photo Editing solution do you use? "photoshop results without the complications!!" 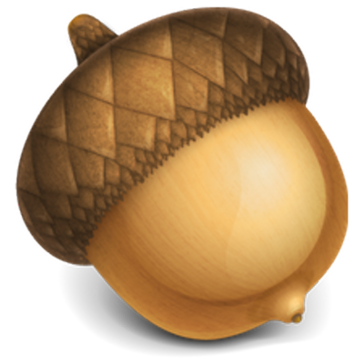 Of Acorn I really like the ease it provides when editing, it is a simple editor where I can edit minor projects whenever I need to. I love the circle text tool and the text on a path tool, make it easy to get my text exactly how I want it to look like. Basically, Acorn has all the photoshop tools, but less complicated and cheaper, which is amazing because if you have experience on the design fields, you can have amazing results with a simple software like this. I think my problem with Acorn is that it is not available por PC's and there are times when working on my cellphone is not the best option, I think they should expand it to PC's too. 1-Easy to use, to set up and to acquire. Not expensive at all and give you the best results. 2-Doesn't have to be a professional to use it and lear how to. 3-It is simple but not basic, which is great since offers professional tools that turns out in professional, elaborated and creative designs. Acorn is so simple to use, that it has really helped in my designs, since it complements my other more complicated design softwares, giving me innovative and creative results in a fast way. With Acorn, I can even give my clients the option to create the basis of what they want in their social networks or web page, and since it is so simple they can do it without much hassle, helping me to work more safely in the extensive design of the image. Also, when there are sudden publications to be made, with this software I do not worry at all about it, it is quite easy to create them and upload it to social media. It has brought me many benefis as a freelancer designer, it has facilitated my work and expanded my ability to work with any kind of editor. I like how simple Acorn is, it really is not complicated to use but it is not basic either, it has the exact and precise tools to create professional editions that are very useful to me. The circle text tool and the text on a path tool are amazing and very useful, make it a lot easier to get your text exactly how you want it to look. The file suppot gives me a lot of confidence since I know my editions are safe, and the streamless editing tools are great as well. It is very cheap for all it offers, i love the ease it offers for creating editions, it is quick to open the software, customize the image, save it and use it!! The free software doesn not include the best tools, and I think that if someone is testing for the first time the software, they can get desmotivated since the software does not show what it actually offers. I would recommend Acorn because with this you can develop your brand or company image in a easy, quick and cheap way, you don't need to have professional designers to create your own images, you can adap everything you put on the software and be original and unique. Acorn benefited me and my company image in a great way, other image editors were very complicated and expensive, and I really needed an image editor to create advertising images in a fast and uncomplicated way, for which I need a software that would contribute to the image of the company in a simple way and that other members of the supermarket could use in the same way. So when Acorn entered my designs life, I solved all those problems, I forgot about difficults and complicated softwares like Photoshop and whe I had to edit an image for the social media of the brand or even to make publicity for printing, I do it with the program having a very good result, so I can save money and time. Acorn satisfied my design needs on the editing field!!! "I can edit image without much problem." Of Acorn I love the ease it offers for editing, it is quick to open the application, customize the image, save it and use it. You do not need to have more knowledge and the images look really professional. It's totally cheap for everything it offers, much more than other complicated software. As I only work with Mac devices, it's great that this works perfectly on them. The Free version doesn't have the most special tools, and I think they should show the customers with free trial what the software offers so they would feel animated to purhase the whole software. And the interface can be more modern, it looks old and the program is really good. I would recommed Acorn to all those people that are not interested very much on being an expert on image edition, but they for some reason need to look like one, this software really offers proffesional and good options to work with. It's easy, it's quick, it's affordable and it's good. Acorn helped me in a great way, other image editors were very complicated and expensive, I really had to focus my design area in other ways and I didn't need to be an expert in image editing, but at the same time I had to find a software that will help me look professional without much mess. So when Acorn entered my life, I solved all those problems, I forgot hard software like Photoshop and when I have to edit an image for a brand or a client, I do it with the program having a very good result, so I can save money and work. Acorn satisfied my design needs on the image editing field. "Good app and really easy but it miss some options"
We bought it because it was a cheap Image editor app and it's really easy to use. Before we had the 2 weeks free try and it made a big difference so we bought it. Everyone in the office knows how to use it and we are not even Designers. Also we are a PRO-MAC company, so having an app done for a MAC makes a big difference. Not enough options to edit your pictures when you come from an app like PHOTOSHOP but to be able to use them you need to be an expert. It's also not for PC so maybe that could be a problem if your company only has PC's. If you want a cheap image editor I think this is the best one you will find. But your company has to use MAC's or it will be impossible for you to use it. Again, great Image editor but maybe not enough if you are coming from photoshop. I solved the price problem because it was too expensive to have PHOTOSHOP for everyone in the office. We are not a company we need the best IMAGE editor in the world, but it's important to have one easy to use and ACORN is easy. Maybe one day, if we miss some extras we will figure out a better app but for now, ACORN is enough. "I used Acorn to do photo editing for my manuscript "
I like Acorn in a way that it is easier to use and Mac friendly. The price is pretty good. I was using Photoshop before, and Photoshop costed me $180 for my PC. When I changed to Mac, I have to buy a new version of Photoshop since it was not compatible (i was not happy about it). So i decided to try Acorn. It is very similar to Photoshop and it is cheaper. Therefore, the price is a big plus. The trial free version did not have a lot of features as the purchase version. At first, I was using the free trial. After 14 days, it automatically taken money out of my account without me realizing it. I wasn't happy about it. However, I decided to keep it anyway since i like the app. However, the company should look into this automatic feature. Some other customer may not be happy with this. I use Acorn to edit my images for a menuscript.
" Acorn has been very helpful in utilizing my spare change into something more"
"Excellent for SMEs in China"
it works in China without a VPN and it's backup history is really good! Bilingual interface still a bit clunky and their is no retina display support - so looks pretty crappy graphic wise on the Mac. If you are an SME in China needing a fast reliable Dropbox equivalent, Nutstore are pretty good. They're English is not great but they are committed to working stuff out quickly. Their dev team is amazing - if you hit a major glitch, they update code within 24 hours...but the product is really stable now and i cant even remember the last time there was a major glitch. Dropbox style features for our company in China with blazing fast speeds and no VPN! "Very competent and bug free photo editor"
It's almost as fully featured as full commercial applications but at a fraction of the cost. The product is very fully featured, it's easy to use, and it does the job a lot better than freeware. "Simple, but not too detailed"
It has standard editing tools you can basically see in a smartphone. The tools are very limited, and work is limited to certain features - for more detailed editing, I would recommend Adobe Photoshop. You can edit in a mass, simply select several photos and customize the editing you would like to make. "Acorn Use for Education: Use Friendly but Glithces"
Acorn has been very user friendly and transition from older software was smooth. There are additional functions that could be integrated (i.e. calendar with alerts) however it is lacking. "Acorn: Invest in the future!" Acorns lets you invest your money in small amounts periodically. Acorn charges more fee ($1/month) for smaller investments below $5000. Acorn lets you invest spare change from your credit card transactions. I like the different photo editing options. Plus, it is easy to use once you get the hang of it, especially if you have learned Photoshop. That you have to buy it, but it is not expensive in the long run. Make sure your computer can handle it, and budget for it. Photoshop was getting too expensive for us so we switched. I am no longer with the group this uses it though. For a first-timer like me, I got too dependent on the fixed amount of investment and did not learn how to evaluate stocks correctly. "Making Investing easy even for this "Millennium Generation"...."
Saving for the future, allowing family members unfamiliar with investing to learn about it. "Acorn makes photo editing simple and enjoyable!" The circle text tool and the text on a path tool are awesome and make it so easy to get your text exactly how you want it to appear! I haven’t really experienced any negatives with Acorns yet. Creating bold and flashy advertising without outsourcing the work has saved me money and given me complete creative control. "Great image editing software "
My favorite new feature in version 6 is Text on a Path - to wrap text around whatever path you draw. Acorn looks janky like MSPaint. Improvement to the graphical look for a graphics program would be great. It's easy to use, affordable, has a great feature set, and has excellent support. Nothing. I love this app. I recommended it to someone today, in fact. I use it mostly for simple resizing, image optimization, cropping, and light editing. Acorn is easy to learn and still lets you use vectors and layers. All the tools are in one place. Acorn is simpler than Adobe with less functionality. If you need to edit photos and cannot afford the time and money for Adobe, use Acorn. I use Acorn for editing images. It is still difficult to navigate and figure out how to do things. Much more limited than photoshop. Saving money to use a software like photoshop. Very easy to use software with very elegant and efficient tools. There is no photo organizer so it is hard to keep them in the same file. It is very compatible with Mac. I am able to edit and share photos with anyone. Alternative to Photoshop Creative Cloud when users don't want to pay a monthly subscription fee. Better than expected. The performance and the simplicity. Some features of the user platform. Lack of certain features. * We monitor all Acorn reviews to prevent fraudulent reviews and keep review quality high. We do not post reviews by company employees or direct competitors. Validated reviews require the user to submit a screenshot of the product containing their user ID, in order to verify a user is an actual user of the product. Hi there! Are you looking to implement a solution like Acorn?